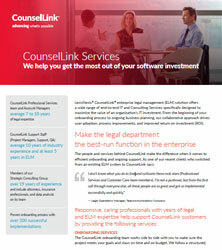 LexisNexis® CounselLink® enterprise legal management (ELM) solution offers a wide range of end-to-end IT and Consulting Services specifically designed to maximize the value of an organization’s IT investment. From the beginning of your onboarding process to ongoing business planning, our collaborative approach drives user adoption, process improvements, and improved return on investment (ROI). The CounselLink onboarding team works side by side with you to make sure the project meets your goals and stays on time and on budget. We follow a structured, six-phased process and configure our solutions to make your deployment a success. We help load your existing data, so you can get a head start on efficiency improvements and data analytics to drive cost reductions and achieve your goals. CounselLink can integrate with multiple systems, including Accounts Payable, Claims, Docketing, SOP, SSO, Contacts, Document Management, Contract Management and more, to lighten your load and share information across applications. Our Professional Services team will help guide you through the process from requirements elicitation through deployment. Become confident users of the system by accessing our extensive library and attending a variety of CounselLink training programs. Whether you prefer convenient on-demand training or web or classroom training, we offer a high-quality, comprehensive curriculum for corporate users, as well as training webinars and resources for law firms. Expert legal consultants provide advice and assistance on performance improvement, business process optimization, and leveraging the value of data and analytics. Holding a variety of credentials necessary for high-quality delivery of projects, our consultants include attorneys, insurance professionals, finance professionals, developers, and data analysts. Our team of legal operations experts will help you assess your department’s proficiency, identify potential cost savings, and fine-tune your operations and business processes to optimize system utilization and maximize performance and ROI. Every customer is paired with a dedicated Account Manager who offers support and serves as the point of contact for issue escalations and communications with LexisNexis. In addition, the Account Manager can provide strategic direction recommendations and offers annual business reviews and ongoing service and training. After your system goes live, the CounselLink team stays close to you to make sure any issues are resolved and you are happy with the system. With access to 24/7 email and toll-free phone support for both corporate users and their law firms, you are never stranded. CounselLink Professional Services team and Account Managers average 7 to 10 years of legal expertise. CounselLink Support Staff (Project Managers, Support, QA) average 10 years of industry experience and at least 5 years in ELM. Members of our Strategic Consulting Group over 19 years of experience and include attorneys, insurance professionals, and data analysts on its team. Proven onboarding process with over 200 successful implementations.